There you have it. Exciting, no? 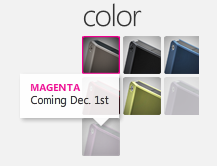 Magenta is coming on December 1st, and so is Purple. I'm kind of curious about these choices because magenta and purple aren't exactly far apart on the colour spectrum. Myself, all I want is a Zune HD with 64 GB of storage. Colours are great, but capacity matters even more.